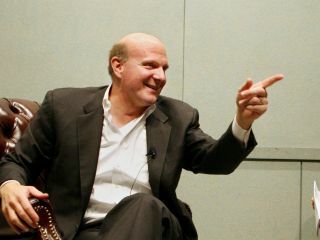 Steve Ballmer - what a character, eh? Everyone knows Microsoft CEO Steve Ballmer has a big mouth, but he spent a trip to Tokyo this week explaining why he wants to be heard even more than before. According to the notorious motormouth, Microsoft is working on a new wave of voice-recognition technology that will enable us to talk naturally to our gadgets and have them respond appropriately. Specifically, Ballmer says the Microsoft 'three screens, one cloud' scenario, where phones, PCs and TVs link to all our data stored remotely, will enable our gadgets to access whatever we need without us bothering with the nuts and bolts of the technology. "In the next few years I know I'll be watching my favourite golfer, Tiger Woods, play in a tournament and I'll see him hit a particularly brilliant shot. "I'll shout at my television set, 'Hey Bill, did you see Tiger make that putt?' and Microsoft software will wake up in the TV, it will recognise my voice, it will know when I say 'Bill' I mean Bill Gates, it'll find him wherever he is, it will see whether he's willing to be interrupted for the call." "Maybe Bill will say, 'Yes Steve, but what golf ball is he using?' I'll literally take my finger and I'll point at the golf ball, a search will go on across the internet to figure out what ball it is, and I'll say 'Hey Bill, that's the new Nike ball, shall I order some for you too?'" And if we had any doubt that Ballmer were serious about that rather Orwellian vision of the future, the reason he was in Japan points to it becoming reality. Among many stops, one was to announce a new scheme to recruit the best of Japan's scientists to collaborate with Microsoft.